Quarry Bank Tennis club is over 100 years old and has been at its present location since 1932. We are a small club but have always punched above our weight when competing with bigger clubs in the region. As a new member I can guarantee you a warm welcome and that you will have access to social tennis, club competitions and inter club league matches. A full range of coaching activities are also available. We are a family-oriented club, I have been a member for over 50 years and other members of my family for many years a well. The club has provided us with many wonderful memories, not just on the tennis playing side but from a social angle as well. Friendships have been made which have lasted for decades. For any further information, please contact the Club... and we hope to see you soon. Singles and doubles tournaments run throughout the year, ranging from one day events (3 per year) to fortnight long events (3 per year) to the two long singles league events in the summer and winter, whereby you’ll typically one match every 10-20 days with the top eight people qualifying for the knockout stages. These longer tournaments are especially popular, with standard ranging from people that joined as beginners all the way through to A team players. These are handicapped to increase the competitiveness of matches (e.g. The best players normally start every game on -30, with first time juniors starting on +15 or +30). These two tournaments run in summer (April-September) and winter (November-March). QBTC has had representation in the Staffordshire league for decades. There are three men's teams and a ladies team that play doubles matches against other teams in the area. The Men's C team started out in 2018, and compete in Division 6 South, while Men's A and B teams play in Divisions 1 South and 3 South respectively. The Ladies team were reintroduced to the league in 2017 and play in Division 3 South. There is also a mixed Herefordshire and Worcestershire League team that play in the summer in Division 5 East and won Division 8 East last winter. In 2017, a men’s team took part in the Herefordshire and Worcestershire winter league for the first time and won Division 12 East. So, whether or not you have played team tennis before, there is plenty of scope to represent the club at various different levels. Cardio Tennis runs on a Wednesday evening 7pm-8pm at a cost of £4 per session. It's a great way to get fit and socialise with other members of the club. The session is run by The Prosser Tennis Academy and is aimed at all ages and abilities. Your first session is FREE so why not pop along and enjoy the fun! The Prosser Tennis Academy offer both 60 minute (£15) and 30 minute (£10) sessions for private lessons, to work on whatever you like. This is a great way to learn new skills, techniques and tactics to implement into your game. Private coaching is open to all member of all ages and abilities and can be booked on a day/time that suits you through the Academy. Junior coaching runs on a Wednesday evening 6-7pm and Saturday morning 10-11am at a cost of £4 per session. 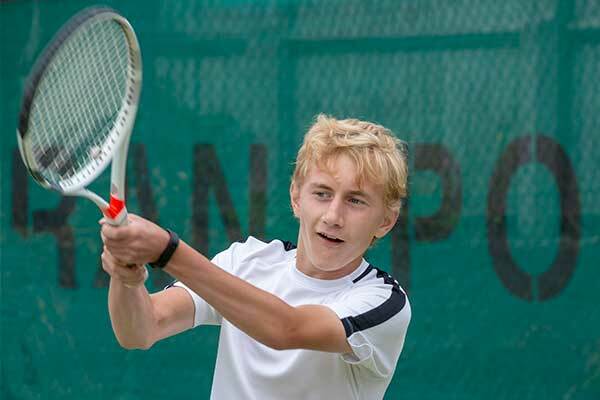 The sessions are aimed at all ages (3-18yrs) and abilities, with our more experienced juniors having the opportunity to partake in the cardio tennis session too. Throughout the year we have a number of tournaments, fun sessions and tennis camps that run to keep the juniors (and coaching staff) busy! Please contact Stacey Billingham or Nikki Parkes for further details on our tennis camps. They run every half term at a very competitive price. There are plenty of family friendly social events throughout the year. The big social event for the club is the annual Dinner Dance and Presentation evening where members and non-members join together to celebrate the year at QBTC. There are also a range of other social events that take place throughout the year. These include: Race Nights, Darts Nights, Skittles Nights, Pub Quizzes, Family Olympics and many more. To keep up to date with all the upcoming social events, follow our Facebook page. During spring, summer and autumn, Friday evenings and Sunday mornings have a regular attendance across differing standards. A great opportunity to mix in and get to know players at the club. To keep up to date with the social tennis calendar, follow our Facebook page, with the new saeason's programme commencing 5th April 2019. If you want to arrange social tennis yourself quite often a lot of people will just give someone a call and ask when they would like to play game of singles or doubles. We pride ourselves on having regular court availability without the hassle of booking. The clubhouse is available for hire for members to hold private functions. Members are entitled to apply for Wimbledon tickets via the club ballot. The club has a variety of categories of membership for different age categories and we offer discounts for families. Note that membership costs are reduced for the first year. 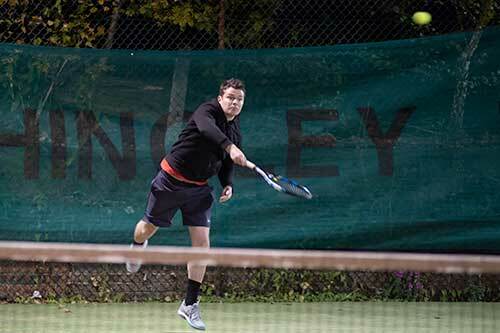 Note that membership provides access to the courts for play to suit, with courts available without the need for booking for the majority of the week. Please see the membership form for current rates or contact the Membership Secretary Paul Julian.